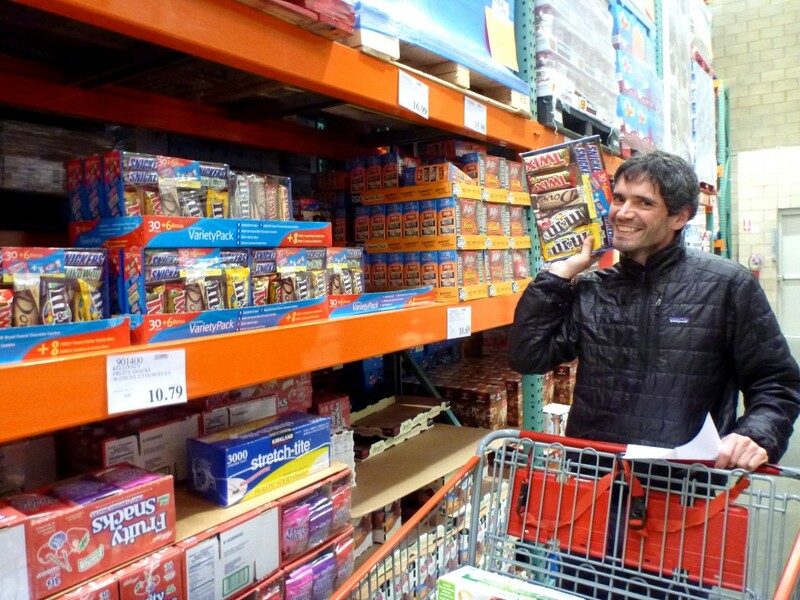 Beat selects a candy bar variety pack as fuel for a race across Alaska. Editor’s note: Beat Jegerlehner is preparing to compete in the Iditarod Trail Invitational, a thousand-mile, human-powered trek across frozen Alaska on the famed Iditarod Trail. The race begins Feb. 24 in Knik, Alaska, and Beat will be competing on foot. 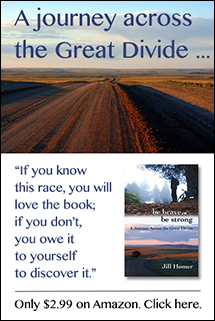 This post is the first in a series covering his preparation and participation in the race. As the checker sorted through Beat’s pile of groceries, her face seemed to turn a pale shade of green. What kind of person buys 78 candy bars, two pounds of salami, several pounds of peanut-butter pretzels, 80 packets of fruit snacks, eight cans of Pringles, four boxes of crackers, 36 tortillas, two pounds of cheese, two pounds of chocolate, a pound of cookies, twelve Lara Bars, two boxes of granola bars, trail mix, nuts, and astronaut ice cream? Then, to top it all off, bulk containers of painkillers, caffeine pills, antacid, and vitamins? These weren’t even all of his planned supplies, nor were they all contained in a single Costco cart. But what was in there was enough for the checker to crack an uneasy joke about hypoglycemia. 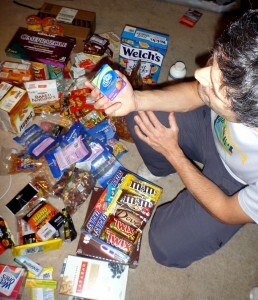 Contemplating antacids atop a mountain of junk food. “Oh,” the checker nodded but continued to look confused as Beat explained he would be walking a thousand miles across the frozen wilderness of Alaska on the Iditarod Trail, all the way to Nome. It seems few people outside a tiny niche of endurance athletes can comprehend what that might mean, and even if the potential of understanding was there, few can get past the cognitive dissonance of the words “race” and “running” as an explanation for tens of thousands of calories in highly unhealthy junk food. Therein lies the paradox of ultra-endurance energy food. It’s hard not to feel gross and vaguely ill while sorting through mountains of jelly beans, gummy bears, potato chips, and salty dried meats. And yet, when it comes to a weeks-long endurance expedition, these morsels of carbohydrates, protein, and fat are the foundation of survival. As Beat hauls his sled across the tundra, there won’t be any fresh citrus fruits, or leafy greens, or quinoa. He won’t be able to access slow-cooked oatmeal, or roasted sweet potatoes, or even wild-caught Alaska salmon. An endeavor like a thousand-mile trek across Alaska during the winter strips life down to its most basic needs. At that level, Beat has to learn to live without fresh vegetables and warm comfort food. Because at a basic survival level, all he needs are calories — as tightly packed into energy-dense foods as possible. 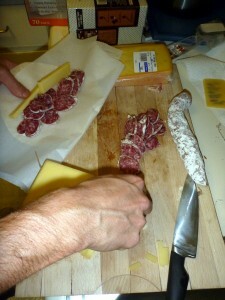 Preparing salami and cheese tortillas for a tasty Iditarod dinner. Beat’s ideal calorie ratio would be 5 or more calories per gram, which will net him about 2,000 calories per pound of food weight. Olive oil has nine calories per gram, close to the highest calorie-to-weight ratio of any food. But few can force themselves to drink olive oil, let alone survive on it, and it’s important that Beat choose foods that are palatable to him as well as calorie-dense — otherwise he may avoid eating until his energy levels are dangerously low. Carbohydrates will also come in handy for a physical grind that could involve as many as sixteen hours of strenuous activity per day, for up to thirty days. When he parses it all out, his food likely falls in an endurance-athlete ideal of 50 percent carbs, 30 percent fat, and 20 percent protein. Because he’ll grapple with temperatures that will likely range between 40 above and 50 below zero, he also has to pack foods that won’t spoil, but will remain edible when deeply frozen. A couple years’ worth of testing helped him arrive at his food decisions: at 40 below, the nougat in a Snicker’s Bar becomes glass-like, shattering upon contact with his teeth. If needed, he can hold chocolate and gummy candies in his mouth until they thaw enough to chew. Nuts and dried fruits maintain a similar consistency in frozen temperatures thanks to their low moisture content. Crunchy foods such as chips and crackers also freeze just fine. His salami and cheese-filled tortillas will be wrapped in parchment paper to prevent moisture absorption, and then vacuum-sealed to lock in freshness. Beat is nervous about what it will really be like to subsist on a junk food diet for most of a month. He’s bringing along multi-vitamins to resupply his body with the nutrients he’ll be missing from a lack of fresh food, as well as Tums to help him get it all down. He estimates he’ll consume between 5,000 and 8,000 calories a day, and is rationing on a 6,000-calorie-a-day basis. In all likelihood he’ll burn much more between the hard activity and maintaining his core temperature in subzero cold. However, 6,000 is about the maximum number of calories that most people can force themselves to digest amid ongoing hard activity each day. The food choices are line with the popular diet of polar explorers and mountaineers, or any adventure athlete who must carry days worth of rations in cold environments. Total: 28.4 pounds of energy food for a hungry endurance athlete. Multiply that by three and you have the fuel for a very long walk across Alaska. Yikes. That list looks like the very tip of the food pyramid. I’m curious if he will deliberately put on extra weight before the trek? Darn – is there enough fiber in there to keep a person’s digestive track functioning? I bet Beat’s dentist loves him. Best of luck with the race, thats going to be a grand adventure! Beat- Interesting!I guess an upside for those who shorten the trek is that they are totally set for Halloween! My 8 year old son might brave the wilds of Alaska for one of those drop bags. I will treat him to some solidarity gummy bear and candy snacks as we follow your adventure. Best of luck! What about superfood powder to mix with water? Definitely not the best tasting but you’d keep up with your veggies. Payday candy bars made by the Hershey company are my favorite ultra food. No chocolate, just salted peanuts stuck to caramel. They’ve got the same protein per serving as Perpetuem but taste WAYYYYY better. Plus the peanuts have enough protein and fat to prevent blood sugar crash. You should give ’em a try sometime if you still like ultra endurance after your trek:). Since they’re individually wrapped, when its cold, we stick them down our pants for 20 min before eating them so they’re all thawed. Have great time! Hahaha. It would freeze. Something more potent maybe.